It’s love at first sniff for two bulldogs that then sparks an unlikely romance between a stressed-out businesswoman and a professional wrestler in the bark-out loud comedy, The Dog Wedding. The Dog Wedding movie is now available on DVD and makes the paw-fect Christmas gift for the rom-com, dog-loving people on your holiday gift list. Better yet, for every sale of The Dog Wedding DVD using code DEXTER, $10 will be donated to the amazing folks at OBG Cocker Spaniel Rescue. Through the fundraising arm of this blog, Wigglebutt Warriors® hosted our first gala fundraiser a few years ago called Wigglebutt Wedding to raise funds for dogs in need. From there, my spouse and I continued to fundraise and now Wigglebutt Warriors does year-round amazing things for homeless dogs and dogs in need. This year, Wigglebutt Warriors raised over $30,000 for another dog rescue with our big Wigglebutts Uncorked gala fundraiser held in April, 2016, at Brotherhood Winery. We are not a big organization: Wigglebutt Warriors is myself and my spouse, Darlene Bryant. Our Christmas 2016 Holiday Project for Wigglebutt Warriors is helping to raise funds sold with code DEXTER of The Dog Wedding DVD movie. This movie is a romantic comedy involving a couple who only crosses paths at a dog park. It is love at first sniff for their Bulldogs. The humans end up coming together, and they discover a connection through their dogs. The target audience is a family: All can watch it together. It is fun, intelligent, and family friendly. It will be rated PG-13 for its public release. 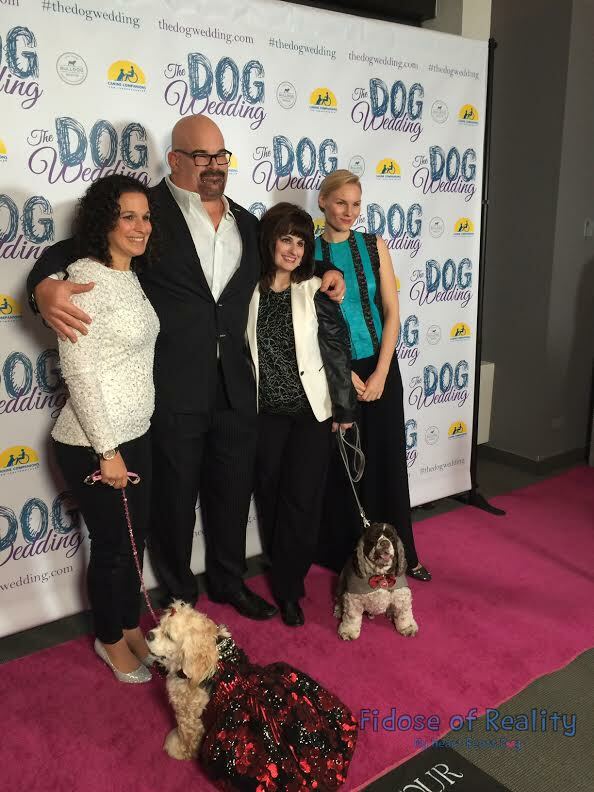 Sitting in the front row for the New York City premiere of The Dog Wedding movie in November of 2015, the grand affair welcomed dogs and people alike. 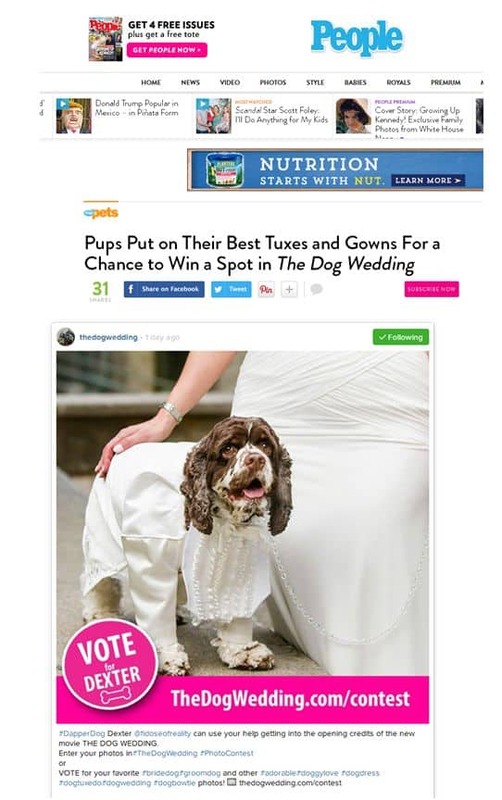 As one of the fifty dogs named winners in the associated photo contest, our very own Cocker Spaniel, Dexter the Wigglebutt Warrior, mascot of Fidose of Reality, looked and sniffed on as his image graced the big screen. With your purchase of the The Dog Wedding DVD movie, you’ll have a keepsake copy and be able to see Dexter’s image on the big screen! Watch our in-person Dog Wedding Q&A where the Producer of the movie calls out Dexter in New York City! Get a copy for yourself and stuff one in the stocking of your dog loving, movie loving, friends, family, co-workers, Secret Santa, etc. The price is right, and $10 of every DVD sold using code DEXTER at checkout goes to OBG Cocker Spaniel Rescue to help dogs in need. Let’s get those tails wagging and lives changed. Available on DVD or Blu-Ray, grab your Dog Wedding Movie here. You must use the Dog Wedding Movie and use code DEXTER at checkout so that $10 of the purchase will be donated to OBG Cocker Rescue. Thank you, and happy 2017 to you and your pack from Fidose of Reality and Wigglebutt Warriors. Hurry, this offer lasts until the end of December…. Is this a movie you’d like to see? That is so cool! I love this idea. It sounds like you had a great time. We sure did – it was a hit. I love it! Dogs are my favorite creatures. They are so full of love and light. This movie sounds perfect for me, and I love that a portion of the proceeds go to a good cause. Oh yes, you will love it. This is such a cute story! I also love that it is done for a good cause and has had some great results. What a fun idea with a big benefit! Such a cute sounding movie! I’d definitely like to see it. That is just too cute!! These types of ivies is exactly whats need now a days to lighten the mood. Sounds like fun! I just keep thinking Lady and The Tramp. Guess I’ll have to watch it and see! Awww look at Dexter!! How did I miss The Dog Wedding movie? I am a crazy dog lady and just hearing about this now! Excellent thought of this idea. So happy to hear that the earnings will go to a good cause. I love dogs and yes, this is something I would love to see. What a great cause. I haven’t heard about this dog wedding movie. Sounds cute and funny.. So glad that it will go to a good cause. I will get a copy! Sounds like you guys had a great time! Sounds like a great movie too – will have to check it out! This sounds like so much fun. I know that my dog wouldn’t let me dress him up. He would growl at me probably. Sounds like such a good movie. This is something I’d love to watch. How cute is this too! What a wonderful concept and a great gift idea for Christmas. YES!! I want to see this movie! OMG Dexter can’t be married? How can he marry my Lyla now? LOL Dexter is a handsome one! I am so happy for you to have been able to be a part of such a wonderful event! Such a good cause…had to share on Twitter. It sounds like a cute romantic movie! I love that cover….it is absolutely adorbs! This is so awesome Carol! Congratulations!! Dexter is, of course, a major star. How can he ever do anything less tha be the perfect dog!!! Well done that amazing Dog Star! This is so cute. My grandmother has been doing dog shows for as long as I can remember. One time her papillon married a Golden Retriever and it was in the paper and everything. Good times! This sounds like a fun movie and a great cause! Glad it is family friendly since we have an eleven year old. I will definitely order a copy. We have 3 dogs from tiny to extra large. What a great cause this is. Thank you for sharing this wonderful story. I’ve seen the previews for the dog wedding and it looks too cute!! I want to see it! cute dog, movie, and idea (cute all around!) sounds like a heart-warming movie (and who doesn’t love those!?) thanks for sharing and congrats! It’s so great that Dex got to grace the silver screen! Sounds like a really fun movie. Sounds like a fun movie and a great cause! I’ve added it to my wishlist. I love that this DVD goes towards a good cause. Also, I cannot stop looking at the dog’s in their red carpet attire – so cute! Wow! That is so neat and it sounds like you guys had a really nice time. It’s wonderful what you are accomplishing under WiggleButt Warriors. So amazing. Just watched the trailer and that looks ADORABLE!! I would totally watch that! Love that DVD sales will give a portion to rescue! I don’t have a DVD player but it looks like it’s available on Amazon Prime so all good! How wonderful! Dex was on the big silver screen, what a special life moment! Is he giving out pawtographs yet? Movie looks really cute! I love that it is also a fundraiser! (P)awesome! Omg this is so cute! I would love to have my pup does this. This movie sounds so adorable! The theme embodies something that all pet owners can relate to – how our pets can bring us together. I have met so many great friends because of my cats! Who knew? I think this is a wonderful idea for a fundraiser. I hope that it sells big time! How cute! Dexter looks very dapper. Is streaming available too? Yay for you and all you do for pups in need! Also, Yay for Dexter being on the big screen! Can’t wait to purchase the DVD so I can make popcorn to share with the pups and watch with bated breath. Dogs and laughter bring people together–this movie has both! Such a fun film, I loved it and am buying the DVD to share this with others! !